Today was my last day volunteering in Hayley's classroom. I'm leaving a month before the end of school because a) stupid jury duty is looming, b) I have to plan a graduation party, and c) I need this month to prepare mentally for a long, busy, child-filled, trip-filled summer break. I've enjoyed working in Ms. A's classroom, especially with the child she had me work with: an ESL student. Most of the I helped him with writing assignments, although occasionally I helped other kids with math concepts. Twice I made posters for Ms A, once I unhooked paper clips from bits of string. I hung stuff on walls, cut paper in the staff paper supply room, and I even watched over the class while Ms. A left the room for a minute or so. 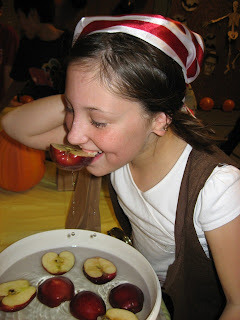 Hayley successfully bobbed for half an apple. This was taken at last year's Halloween party at church.